THE second volume of President Xi Jinping’s book on governance was published in both Chinese and English in November 2017. Since the publication of its first volume in September 2014 which collected Xi’s works from November 15, 2012 to June 13, 2014, the book has received widespread attention and praise from readers at home and abroad. Recently, Independent News & Media of South Africa wrote in its online report that the book was the most systematic and authoritative source to know about the process of realizing the Chinese Dream of national rejuvenation. As it pointed out, in its 600-plus pages, the word – “people” has been mentioned more than 1,200 times. While The Star – one of South Africa’s most influential newspapers, commented that the world order has been changed and it is time to build a community with a shared future for humankind. Over the past three years, Xi, general secretary of the Central Committee of the Communist Party of China (CPC), has continued to put forward a series of new concepts, thoughts, and strategies, enriching the CPC’s theories. 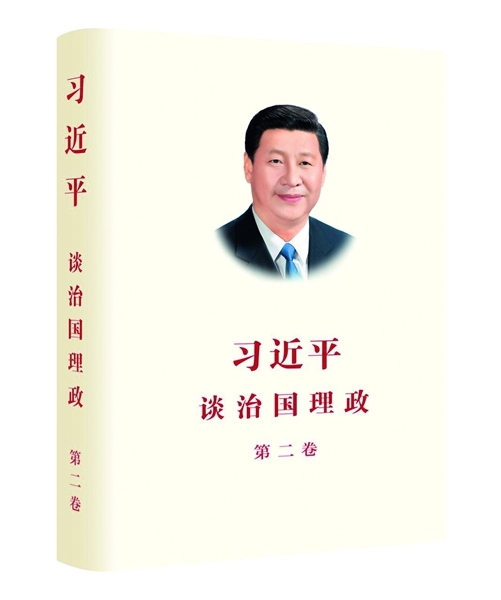 What does the second volume of Xi’s book talk about? 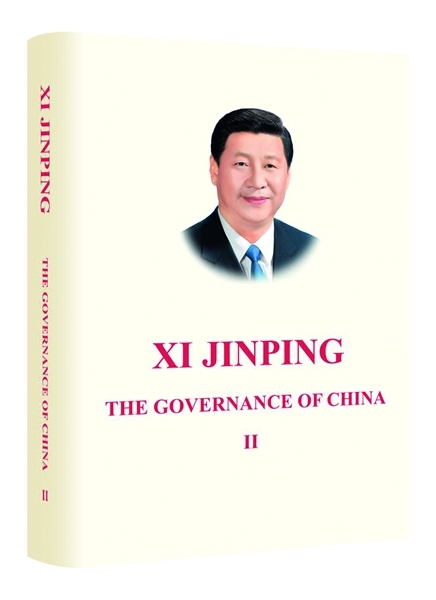 The articles in the second volume of Xi Jinping: The Governance of China are divided into 17 chapters. It collects 99 of Xi’s speeches, conversations, instructions, and letters between August 18, 2014 and September 29, 2017. These 17 chapters are respectively: Socialism with Chinese Characteristics and the Chinese Dream; A Moderately Prosperous Society in All Respects; Deeper Reform; Rule of Law; Governing the Party with Strict Discipline; New Development Concepts; The New Normal of Economic Development; Socialist Democracy; Cultural Confidence; The Wellbeing of the People; Beautiful China; Military Development; One Country, Two Systems; China’s Diplomacy as a Major Country; Peaceful Development and Cooperation with Other Countries; The Belt and Road Initiative; A Community of Shared Future. The book also included 29 photos of the Chinese leader, reflecting the moments when Xi conducted field investigations in local areas, inspected key infrastructure projects, attended important ceremonies and international conferences, and met with leaders of other nations over the past three years. David Ferguson, an English editor of the book, highlighted some topics he thought would be of particular interest: the fight against poverty, the anti-corruption campaign, and the Belt and Road Initiative. According to David, China has done more than any other country in terms of the fight against poverty, and this is really an area where the rest of the world can learn from. He thought the anti-corruption campaign in China is a genuine fight against corruption and is having an impact on the lives of ordinary people. He believed that there is a need to continue to send that message to foreign readership – it’s happening, and it’s working. The third aspect is the Belt and Road Initiative. This is a joint initiative that is intended to help developing countries to progress together. If it works, it will transform the prospects and the future of many poor countries and developing countries. All in all, the second volume charts the efforts of the CPC Central Committee, with Xi at the core, in uniting and leading Chinese people to uphold and develop socialism with Chinese characteristics in a new era. It reflects the development and main contents of Xi Jinping Thought on Socialism with Chinese Characteristics for a New Era. The new book provides Chinese wisdom and solutions for developing a community with a shared future for humankind, as well as in promoting peace and development. During the 2017 Fortune Global Forum in Guangzhou in December, Consulate General of the Republic of Singapore in Guangzhou, Chua Teng Hoe noted that, as both China and Singapore are Asian countries, knowing more about President Xi’s governance philosophy would help to further understand China. Frank-Jurgen Richter, CEO of a Swiss think tank Horasis, said that he was carefully reading the book. From his perspective, the book discussed the future of China and some new governance ideas. President Xi is not only centered about China, but also calls for the whole world to build a multilateral dialogue mechanism based on mutual trust and friendship. What’s more, the book sends an optimistic signal that the Chinese Dream is also the world’s dream.